The month’s contribution to Heads Shoulders Knees comes from the very brave (lol) and lovely Georgia from Georgia’s Little Kitchen! Georgia is an advocate for cooking with little ones and involves her sweet little girl, Ella, in her cooking projects (See?! Told you she was brave Lol!). 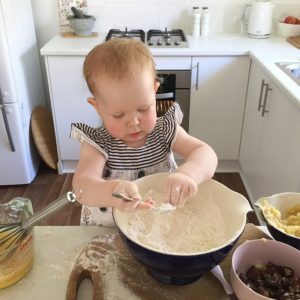 Georgia makes the cooking experience fun for her family and has noticed a real burst in Ella’s development since she embarked on this journey with her. 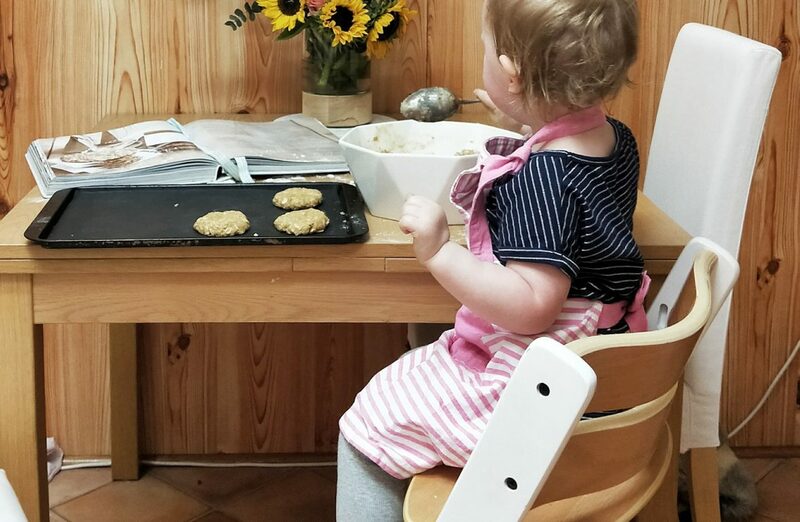 Read on to find out how Georgia tackles this playful journey with Ella and hopefully you can pick up some tips and inspo to start cooking with your babes too! I know that I feel more confident to cook with L after having read this. Cooking with kids. It’s incredibly messy and totally unpredictable…if yours are anything like mine, they will inevitably spill half the flour, add too much sugar and probably drop an egg on the floor (sound familiar?). But, mess aside, inviting your kids into the kitchen with you is the perfect opportunity to playfully engage them in your everyday tasks. With a bit of planning, creative thinking and patience, you’re giving them an opportunity to explore their senses, gain an appreciation of different foods and textures, and grasp new and exciting educational concepts. I’ve been cooking with my daughter Ella since she was old enough to hold a spoon. At first, it seemed so easy. When she was little, I could sit her in the high chair and hold her hand as she helped me measure or stir, making sure she kept it all in the bowl. I believe that children learn best not only from observing us, but by helping in their own messy little way. 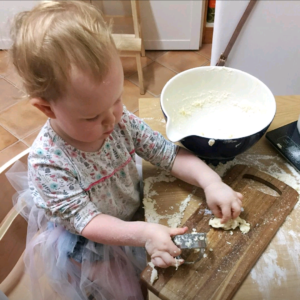 Cooking is a skill my daughter will use throughout her whole life, and her appreciation of wholesome, homecooked food starts in our kitchen. Being by my side as I bake some muffins or prepare dinner, and being invited to assist with the simplest tasks, allows her to observe processes that she will use for years to come. And kids just absorb everything! My daughter has a play kitchen, and I often hear her repeating things to herself that I’ve said whilst cooking with her, as she makes her teddies “dinner”, or whisks up a “cake”. Yes, I know, we’ve all been told not to play with your food…but when you’re cooking with your kids, I think you totally should! Play is so important, it inspires kids creativity and their sense of fun, and with food, it generates an appreciation for different ingredients, and it has allowed my little one to explore different textures and tastes without actually having to sit at the table and eat. I’ve watched her pretend spinach leaves are rockets whilst helping me make a salad..she flat out refuses to eat spinach at the dinner table, and I was so surprised to see her “fly” them straight into her mouth! When we’re cooking, she gets my undivided attention. Quite literally. Not only am I one step away from her the whole time (mainly to make sure she doesn’t spoon feed herself butter or knock the flour container onto the floor), but I’m also talking her through every step and guiding her hands. She listens more intently to me be in the kitchen than anywhere else, and often tells me funny little stories while we’re rolling cookies. If we’ve had a tough morning, I’ll often get us into the kitchen for some quality time to get our day back on track. So if you’ve never cooked with your kids before, how do you start? Honestly, just pick a recipe (an easy one) and go for it. If you’re not a baker, then don’t bake. 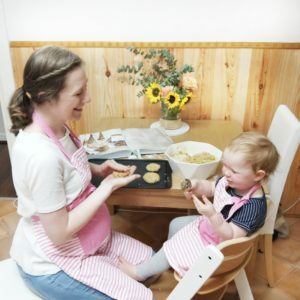 Get them to help with dinner prep, there are tonnes of things they can do…wash veggies, use tongs to toss a salad, or try to peel mushrooms (my little one’s job is to pull out the stems – and she takes it VERY seriously). Or make bliss balls, all you have to do is measure the ingredients, turn on the food processor (my daughter’s favourite part! ), and roll them into balls. Set your boundaries, be clear on what they can and can’t help with. My little one knows that she has to wait near the fridge when the oven’s open, and that she’s not allowed to touch the big knives. While you want them to have a go, you don’t want any disasters. Each time we cook I reiterate that those rules are to keep her safe, and usually she’s too busy doing her “special jobs” to question me. Be prepared for mess. It will be messy, especially if they’re little, but relax and have fun with it, mess can be cleaned up. Remember its all about having fun and enjoying the process, and not about a picture perfect end product! Whatever you do, it should be a FUN, engaging and rewarding experience for all of you! You should feel like you’ve just spent an hour or so playing with your child, giving them your undivided attention and allowing them to learn and appreciate the process! Happy cooking! Thanks for reading Georgia’s contribution. For more tips on cooking with kids head to her Instagram account www.instagram.com/georgiaslittlekitchen/ and show her some love! I’m sure you will enjoy watching her sweet little Ella cook away before bubs number 2 arrives! Yay!